On Social media, we see bartenders are claiming to make over $100,000 per year bartending – is this BS or the truth? – Simple Answer is YES it’s the truth, it is very possible to do this. Bartending can bring in phenomenal money – in many cases, but I’m not going to try to convince you that a six-figure bartending job is common, hustle sold separately. Work is work, and one has to put in the work. If a bartender makes all the right moves, however, it is possible for a bartender to find just the right situation to rake in the much sought after $100k. Vegas, all the big sporting events, march madness, St Patrick’s day, the night before thanksgiving, new years eve, a nig MMA fight – you get the picture – every day I’m hustlin! On a national level, the yearly salary for a bartender barely passes $20,000. The averages are considerably higher in certain states, such as the West Coast, the North-East, and Hawaii, where a bartender reportedly takes in roughly $30,000 annually. “Reportedly” is the key word in that sentence. In reality, a bartender takes in much much more because of their tips, which are cash money and loosely reported. The labor statistics of a bartender make bartenders laugh! The majority of a bartender’s income is made up of their tips. 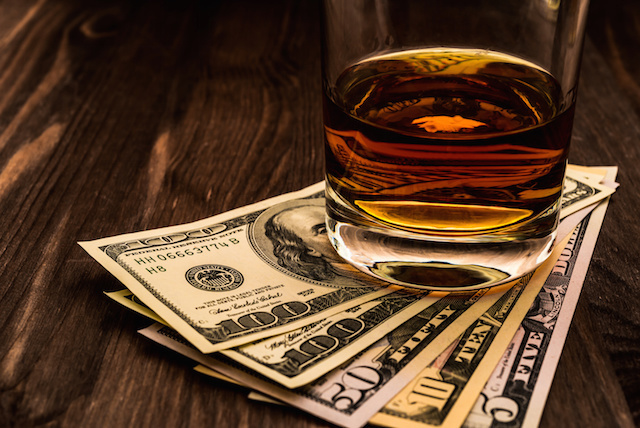 These vary based on the type of bar, the region of the country, and the time of the year, but regardless of the circumstances, pretty much every bartender expects to take home a big wad of cash each night. After all is said and done, it is estimated that bartenders take between $45,000 and $73,000 annually, thanks to their tips. It is very difficult to say what constitutes an average night of tipping as it all depends on the customers at and the shift you end up working. In a lazier dive where drinks are cheap and the customers are even cheaper, a decent night might constitute in the neighborhood of $40 – $60. On the other hand at a high end restaurant or busy nightclub where drinks are pricier and the client is more willing to throw around some cash, a bartender might expect to bring home no less than $200 per night. I’ve worked at every type of bar there is, from the down-and-out dumps to extreme fine dining, and at this point I have a pretty good idea of what can be pulled in on the slowest nights and what can be made on the best. Knowing when and where to work play a big role. You have to be able and willing if you are going to crack the big bucks, when all your friends are out partying and spending cash – you have to be disciplined to work your shift and make that money. On the low end of things, a bartender can literally walk out the door with next to nothing. I worked at one place where the policy said that if not a single drink was sold over the course of a shift, the bartender got to take home $20 out of the till. But this was at a little brewery in the middle of nowhere, outside of a town where a Monday night was as lazy as lazy can get. On a Friday night, when everyone in town was looking to blow off some steam, I could pull in as much as $200 on a good night. Then there were extraordinary nights when the town was hosting some kind of event and I would make at much as $1,000. These were very few and far between. At a more average bar say a fairly well attended music or dance venue, sports bar, or middle-of-the-road restaurant—things are generally pretty steady. On a slow night you might take in $40, on average around $100 or a little more, but $250 per night is about as good as things get. There are of course random circumstances like birthdays or bachelorette parties that pop up, and in these situations you can usually depend on at least a $75 to $150 bump in your usual take home. At the higher end of things we find the raging high volume nightclubs, fine dining restaurants, and some of the specialty cocktail bars and vacation destination bars. In some of these establishments—especially the fine dining—you can expect the occasional night where virtually no one comes in. In these cases even if you only serve one or two tables you should make at least $40. On average, however, the lowest a person can expect working at anyplace on this tier exceeds $150. Good nights can bring in as much as $500, and when the stars line up just right you can hit $1,000!!! There are a few places where a bartender can make a ridiculous amount of money. These are the establishments where that fabled six-figures may be found. They include anyplace where the clientele is comprised solely of the extremely wealthy, such as high-end resorts or the fanciest of restaurants. I once worked at a resort where I never left at night with less than $300, and I could count on making $800 or more at least once a week. Right there alone the math surpasses the $100,000 mark, but many resorts—such as that one—only operate on a seasonal basis and are only open for four to six months or so. The goal of any bartender in this sort of situation is to rake in as much as possible than take it easy for a few months. I know several female bartenders that seek out the NFL, NBA, and MLB after party hot spots and apply soley to these places – u a balla? One of the main reasons that a bartender can earn so much money at these kinds of place is not only due to the wealth of its customers, but thanks to fact that they enjoy exclusive treatment. It should be the goal of any bartender at such an establishment to cultivate good relationships with each regular customer and learn the specifics of their lives and drinking habits. It isn’t difficult to do, simply because very few people can afford to frequent such a place and therefore you have less to remember. I worked at one high-end scotch bar and restaurant where I had a regular who would tip me $50 for each drink, simply because he enjoyed my conversation and I made a martini exactly how he liked it. If you can land a steady job at one of these places—and there are very few of them in the world—you will be on your way toward $100k. No matter where you work, whether it be the slummiest dive or a $1,000 per night resort, squeezing the most out of your customers works pretty much the same way. First of all, remember everything you can about each of your regulars. Names, details about their work or family, how they like their drink, their opinions—-whatever. Every time they see you they should feel like they’re in the bar from Cheers: where everybody knows their name. As for the customers who aren’t regulars, take the time to swap a few friendly words and be amiable, no matter how busy you are. And when you deliver their check, give a handshake and exchange names. It puts a personal touch on things. This should be obvious, but never let anyone wait too long for their drink. For every second that they sit dry, your tip reduces. Pour fast and pour hearty—no one likes a weak drink, but they’ll rarely hold a stiff one against you. Always have a good story or a bad joke ready. A large part of your job is to entertain and provide socializing. When things are slow, take the time to talk with your customers. Sometimes you end up locked in conversation with obnoxious or prattling people, but sometimes you find yourself in incredibly interesting discussions, and in either situation you usually end up well compensated for your time. A good song can go a long way. Have a wide selection of music available, and pay attention to the vibe of your customers. Try to put on the tune that hits the mood perfectly. Flirt, but not too much. Know when a compliment or a wink is playful, and know where the line is drawn. Everyone enjoys a bit of enticing attention, but remember that there is a time and place for it, and that pushing it too far can bring negative results. …then you’ve probably become a pretty good bartender. It is perhaps time to start looking toward acquiring a job at one of the higher-paying establishments. It can be difficult to work your way to the top, but a well-liked bartender can usually fit-in under any circumstances. I once hired a heavily-tattooed, over-pierced heavy-metal dude to bartend at a super-classy joint I was running. His rough edges didn’t deter me, as I could tell that he was a really good bartender. Although he was different from the upper-class clientele in every way, he got along fine and in-fact was one of the customers’ favorites. The reason was simple—he could be conversational, he could be funny, and he made drinks well. That’s really all there is to it. The bottom line is, you shouldn’t expect to jump into the bartending game and start making the maximum possible income immediately, but if you do your job well you’ll always make good money no matter where you work. And as you get better at the whole process, the only place to go is up.